A few weeks ago my husband had to go into work on a Saturday. There had been a sudden influx of business and some technical issues. He eagerly accepted, as he does most opportunities for overtime, and let me know that he wouldn’t be home that Saturday. 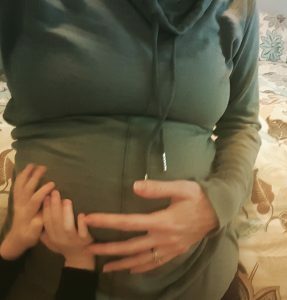 Being pregnant is a wonderful, amazing, miracle of an experience. You get to create this life inside of you, and then feel it grow and develop. Eventually you baby grows to become a tiny person that you will grow to love more than you ever thought was humanly possible. Plus, there is nothing quite as wonderful as new baby snuggles. She yelled “It’s moving!” when she felt something, but the joke was on her because it was just gas.